← 103 "Secrets of a Successful Marriage"
The couch builds itself on top of the Simpsons. "Beans are neither fruit nor musical." "Bart of Darkness" is the first episode of Season 6. It aired on September 4, 1994. The episode was written by Dan McGrath and directed by Jim Reardon. 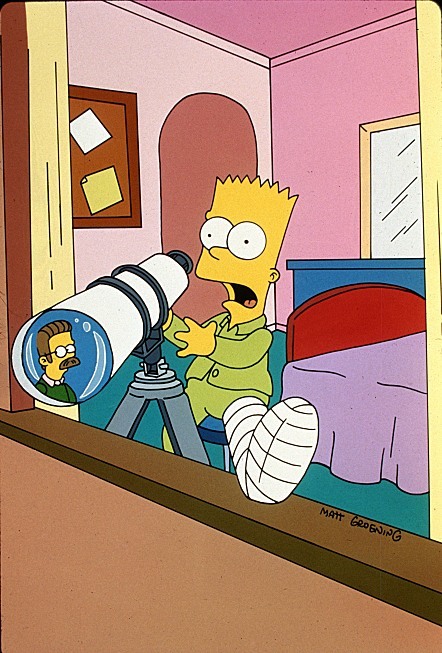 "After breaking his leg, Bart spends the Summer at his bedroom window, spying on the neighbors with a telescope. Bart finds the view boring until he sees Ned Flanders murdering his wife." At the start of a very hot summer vacation, the Simpsons' fridge breaks after a failed attempt to beat the heat. Fortunately, Otto comes to their salvation with the Springfield Pool-Mobile. Bart and Lisa and the rest of the neighborhood kids enjoy the pool time until Otto tells them that their time is up and that the city doesn't have enough money in the budget to come back. Upon hearing this, Bart and Lisa convince Homer, rather easily, to buy them a pool. The Simpsons buy a pool kit from Pool Sharks. On their first try, they mistakenly build a barn instead of a pool, which an Amish man admires, but which frustrates the family because they still can't go swimming. On the second try, the Simpsons build a proper pool and suddenly Bart and Lisa become the most popular kids in the neighborhood. All the kids at Springfield Elementary, as well as kids they don't know (and who also don't know them), show up at the Simpsons house every day to swim. However, when Bart is dared to jump from his treehouse into the pool, he gets distracted by Nelson ("Your epidermis is showing!") and falls and breaks his leg. Bart is forced to stay indoors with a cast on his leg while Lisa enjoys her newfound popularity with the other kids swimming in their pool. Marge and Lisa soon take notice that Bart is becoming isolated and weird. To suppress Bart's sudden paranoia, Lisa gives Bart her telescope for something to do. He first comes to the conclusion that the universe is boring and instead uses the telescope to spy on Springfield residents. He finds nothing even remotely interesting to spy on, until he hears a female scream and spots Ned Flanders burying something in his backyard. After hearing a conversation between Ned and Rod and Todd, Bart thinks that Ned will kill them too. When Lisa becomes unpopular again when Martin Prince sets up a better pool in his backyard, Bart convinces Lisa to sneak into Flanders's house and snoop around for evidence. However, Bart sees Ned coming into his house with an axe. Certain that Ned intends to kill Lisa, Bart tries to call 911, but only gets an answer from an automated recording. Bart decides to save Lisa on his own and struggles to get down the stairs and out the door, encountering many setbacks on the way to Ned's house. Meanwhile, Lisa becomes aware that Ned has returned home and is carrying an axe. She hides in the attic and Ned follows her. Bart arrives just in time for Ned to put the axe on a mount on the wall. He is dumbfounded when he sees Bart, who demands to know why he killed his wife. Ned is shocked to hear Bart say that he murdered his wife and passes out. The police arrive to the scene with both families, including Maude. Maude explains that she was actually at Bible camp for a week, learning how to be more judgmental. When Bart asks Ned about the "murder" that he saw, Ned breaks down and says that he accidentally overwatered Maude's favorite ficus plant, panicked, and then buried the remains; he had planned on replacing it before Maude got home. Bart then asks about the woman that he heard scream, and Ned says that he can't explain that. When Lou digs up Maude's dead ficus, Ned lets out a shrill-like scream. Bart then concludes that everything is normal. Meanwhile at Martin's house, his pool becomes too overcrowded and bursts. Everyone leaves and Martin becomes unpopular again. Before the credits role, Nelson rips his swimming trunks off. Dan McGrath wrote the episode and Jim Reardon directed. Originally produced and planned to air as part of Season 5, this plan fell through when the Film Roman studio (who animate the show) was damaged in Northridge earthquake of 1994. Because of this, the writers and animators had to move to a temporary studio, which delayed production. The episode was later broadcast as part of Season 6. It should be noted that Ned Flanders' (rather feminine) scream was performed by voice actress Tress MacNeille and not his regular voice actor Harry Shearer - one of the few times in the series where such a thing has happened. Wikisimpsons has a collection of images related to "Bart of Darkness". The episode received positive reviews from critics and was generally named "a great start to the season". Warren Martyn and Adrian Wood, authors of the book I Can't Believe It's a Bigger and Better Updated Unofficial Simpsons Guide, called it a "fine episode" and found that the "eventual explanation for [Flanders' murderous behavior is hilarious." Modified on July 9, 2017, at 08:15.